The human female is going on one of her planty expeditions today. She’s been invited by the Ecology class to tag along and put names on all the trees. Pfft. *I* could do that. “This is Ragnar, this is Ulf, and this is Bungo.” But maybe they want the slanty Latin names. Sigyn was invited, too, and I am going with her to keep her safe. This is Texas–there is poison ivy. Poison ivy and fire ants. Poison ivy and fire ants and ticks and mosquitoes and killer bees and alligators. 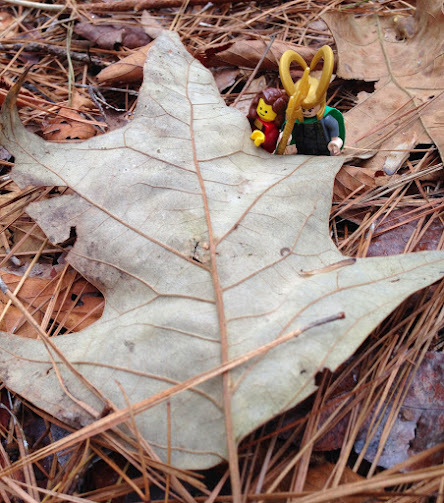 Also, I don’t trust the human female not to forget Sigyn in the woods. We all have to wear bright reflective vests so that no one gets lost, and so that no one is shot by a hunter or “sportsman.” This is Texas–there are ticks and mosquitoes and killer bees and alligators and PEOPLE WITH GUNS! We can hear someone firing a rifle not too far away, so yes, I will wear the stupid vest, even though it’s too big and clashes mightily with my cloak. 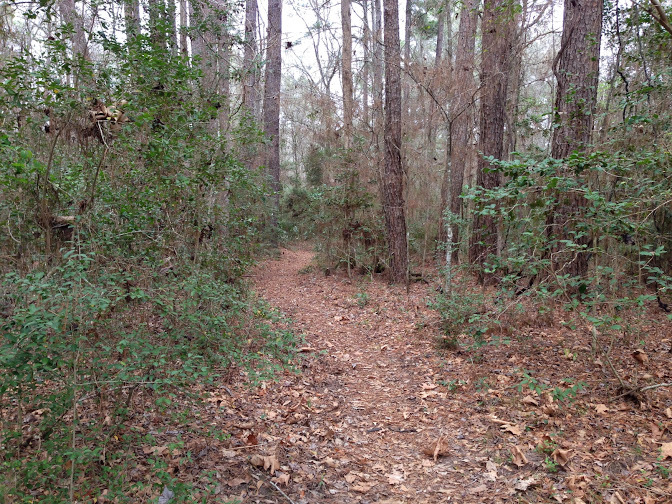 I’m no botanist, but even I can tell that the woods here are different from the woods around the human female’s home. Those tall, straight trees with the scaly bark are pine trees. They smell good but are sort of sticky. Hard to climb, too, as the branches do not begin until very far up. The class is departing to go Do Science. Let us tag along and see what else is here. Someone has left some candy in the break room. The human female calls it liquor-ish but insists it is not alcoholic. There are red bits and black bits. 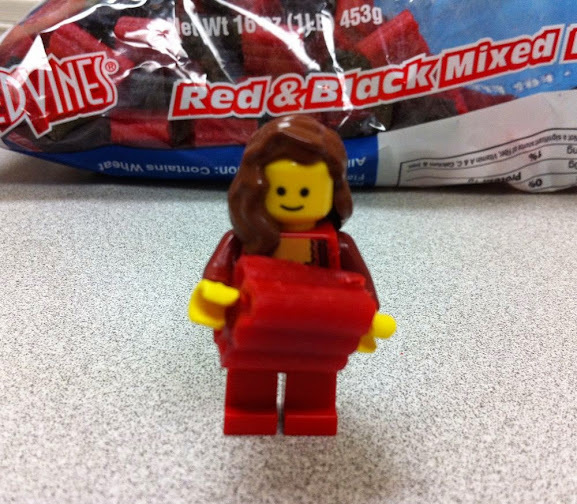 Sigyn, of course, wants to try the red first. I will try the black. <munch..?? ?…> Bleargh! This stuff is vile. And I am not sure it is fresh. Is it supposed to have the taste and consistency of an old automobile tire?? Since it is so resilient, and since it is helpfully pre-cut into easily-manipulated chunks, I believe it would make a better construction material than a confection. No one at the human female’s job likes to spend a lot of time in this little room. It’s where the hazardous chemicals are stored and where the hazardous waste disposal containers sit until they are picked up. Everything is handled safely, but even so, smells abound. I’ve only been in here for five minutes and I swear I can feel myself mutating already. It’s all very unsettling, claustrophobic, and dismal, but I need to inventory what’s here to see if there’s anything I can use in taking over the planet. Tsk, tsk. Just look at this sink. "Stainless" steel, my right eye. It’s all the weird stains and dyes they’ve dribbled and slopped in there, I suppose. "Coomassie" this and "methylene" that and "Congo" the other thing. It’s nearly as bad as it could possibly be. But there’s always room for disimprovement. How about more plumbing-fu? I’m not bored with water high-jinks yet. This is a sweet little puddle. It has outrun the paper towels. (Which is not surprising. 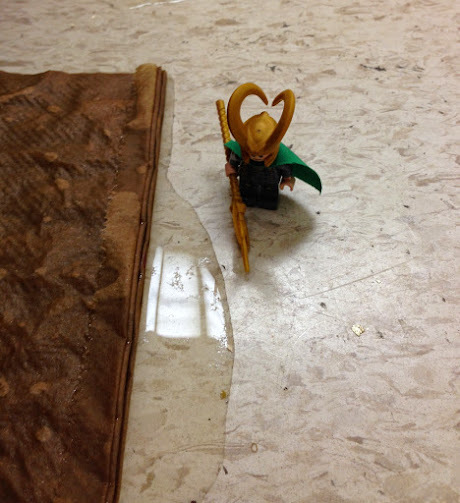 Midgardians are a moderately clever bunch, but they’ve yet to come up with a lab towel that will actually absorb moisture rather than pushing it around.) Can you guess where the water is coming from? Ehehehehehe. I’m so clever I scare myself. I’ve rigged it so that when someone runs water in that blotchy sink, the water comes out from under the other side of the cabinet! 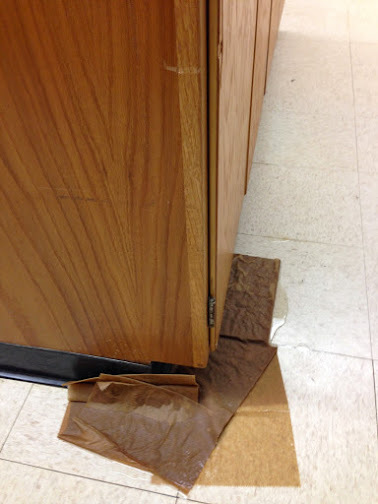 Now it’s not just the Hazardous Chemical Room, it’s also the Slip-and-Fall-Hazard Room! Ehehehehehe! I’m hoping the water is seeping down and dripping as a ceiling leak on the second floor, below. Why should the folks on third have all the fun? Oh, and the crews from maintenance haven’t replaced Ol’ Gusher the Ever-running Sink in the lab down the hall yet. Sigyn! 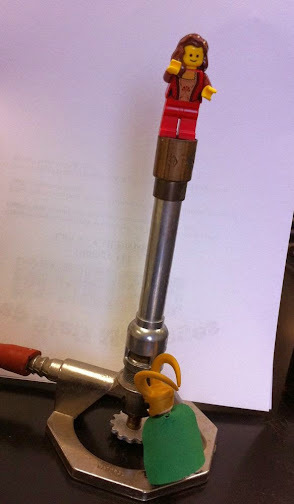 I admire your balancing skills, but that is NOT safe Bunsen burner technique, and I am pretty sure you count as a flammable! Let me shut off the gas flow before some brainless undergrad starts playing with the striker! 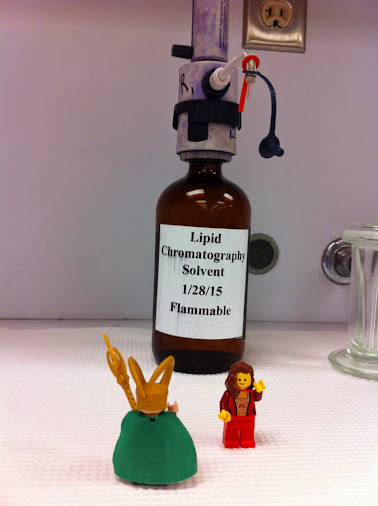 Lab safety is so important. For example, one ought to know where the first aid box, the spill kit, the fire extinguisher, the eye-wash station, and the emergency shower are. Sigyn! That is NOT the emergency shower!!! Just to keep you apprised. The plumber has been out to look at the Misbehaving Faucet That Gushes yet again. Yup, yup–it’s still there. Nope, hasn’t been permanently fixed. The human female is insisting, again, that the faucet be replaced. Amazingly enough, the university has no stock of fixtures, but one can possibly be ordered. It was supposed to have been ordered last week, but I distracted last week’s plumber with a sandwich. The other problem faucet, twice fixed, is now…dripping…again. There is a small chance of freezing rain this afternoon or tomorrow. Someone, on behalf of the the university’s Law School, anticipating Fimbulwinter, called in a Code Maroon and cancelled classes today, leading to all sorts of people thinking the main campus is closed. Some students will be completely crestfallen to learn they skipped Biology and it was unexcused. I may–or I may not–tinker with the weather to coat everything in ice tomorrow morning. I’m still debating what would cause the most trouble–getting all the schools to close for a situation that does not actually develop, or encouraging them to pooh-pooh the ice and not cancel things until everyone is skidding merrily about and it is too late to avoid a hundred minor but traffic-snarling accidents? Decisions, decisions. And I hid the human female’s office key over the weekend. Someone found it for her this morning, but not before she had a proper panic. Uh uh, no way. Except for the burnt shoe buns, I’ve been a good sport and I’ve tried everything on this rotating table. But I’m drawing the line at food that comes in leaves. I am a god, and a food packet whose wrapper looks like something the human female might rake off the lawn is beneath me. What’s next? Something served in a sock? Ah, this is more like it. Sigyn has gone to the buffet at the side and come back with this interesting sheet of crispy bubbles. <tap, tap, tap.> They sound hollow and smell sort of waffle-y. Sigyn, I’ll try one if you will. Hmm. Not bad. And yes, they are hollow. Oh, now this looks delectable! Egg custard tartlets! Frigga used to make something similar, but hers had bits of fruit and some special spices. Mmm. These are good, but Frigga’s were better. 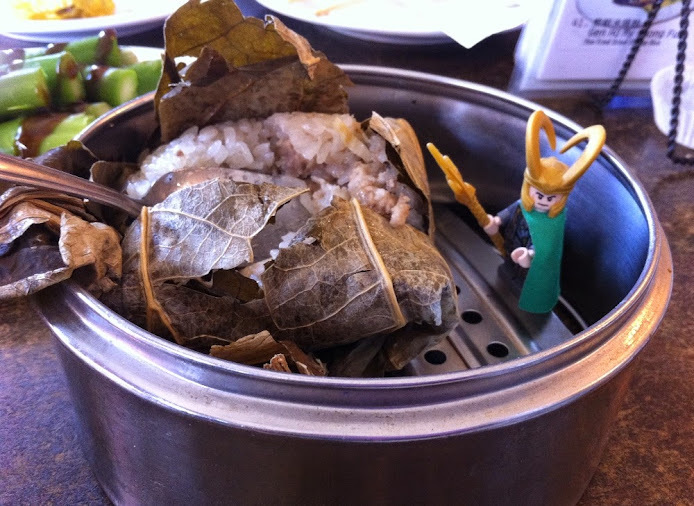 Who knew Chinese food could make me homesick for Asgard? Happpy New Year. Call your mother.